I used this Matte Clay Concealer before my foundation, just on the blemish spots that I had and let it dry before I applied my foundation over it. Because of the cream and dry fast formula I prefer to use it before my foundation and not after, for me personally it looks better this way. This concealer is really pigmented and you will need a very small amount of product to conceal. You can apply it with a small foundation buffing brush or a simple eye shadow smudging brush but works just as good with fingers, a small synthetic flat brush and even a beauty blender sponge. I have been wearing it on my face for 12 hours and it looked really good at the end of the day, but I dont sweat and my skin is not oily. Despite the fact that this is a cream concealer it has a really light and airy texture that will look natural on skin. I also used it under my eyes but because my skin there is really dry I prefer something liquid and without tea tree in it , as it can cause irritation or sensitivity if tea tree is used near eyes. According to The Body Shop site this concealer is suitable for all skin types. Something I forgot to mention on Instragram but I will say it here because I saw that for some of us size is important: this concealer is really small, it has only 1,5 g compared to most cream concealers that are at least 3g but is so pigmented that you will need just a tiny bit of product. I personally never finish a 3g cream concealer before 6-8 months and that's when it expires and I wear a loooot of makeup. 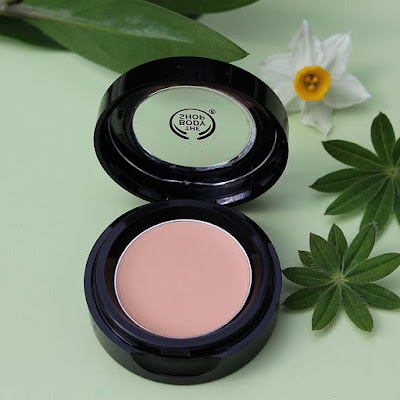 Hopefully I covered everything regarding this new concealer from The Body Shop, if you have any question about this product please dont be shy and use the comments section! What type of concealers do you prefer : cream in a jar/pan, liquid in a squeezing tube or in a tube with wand or maybe concealer stick ? Do you think you need something like this in your life ? This product was offered to me for free by The Body Shop Belgium and Hivency. In the past me too, but I think their products changed a lot.I always check the ingredient list to see if there is something that I am allergic to. I was really afraid to use their clay and tea tree mask (Himalayan charcoal) because it has menthol but everything went good and I love the mask, I only have a little left of it. I really don't know what to say about this. But the product really sounds wonderful and i am sure it will work wonders for all the ladies out there. Oh wow, I have never heard of Matte Clay concealer, sounds really cool and exactly what I need trying to hide my pregnancy grey skin...LOL! It is a new product this is why you probably dont know it.Congratulations with your pregnancy! I usually prefer the liquid one for under my eyes and the cream one for other imperfections.I am also all about a fresh natural look. Great overview of the product. Concise review of what looks like a great new product from the Body Shop. Thank you!I am really happy if you think my review was helpful. This looks like a good product and one worth trying. Clay is always good on my face and the Tea tree oil works really well for spots, too. I agree with you, tea tree is amazing for pimples and spots like that. I have been using Body Shop products for over 5 years now and I have never been let down. Haven't tried this one yet but seems like worth it. Great review! wow that's a really long time, do you have any favorites from them ? I've been looking at replacing my make up with products that are vegan and cruelty free, I'm going to look for this, thank you! you are welcome,I am doing the same! Body Shop from day one has been one of my favorite stores. They have awesome products. Thank you for the great review. Makes me want to delve unto using their makeup. So happy to hear ! Speaking of their makeup they just introduced the most beautiful summer/bronzer all in one and back up as an eye shadow too.Looove multifunctional products like that, dont you ? I am curious to how it would be with someone who has oilier skin. My girlfriend does and so she needs product which works with her skin type. This concealer works the best for oily skin because of the ingredients. maybe she can look it up in their store and pick a shade that suits her skin color. They also have a matte foundation with the same type of ingredients like the concealer that will suit her skin type. I haven't tried the foundation myself but maybe she can ask for a sample to see how it works for her skin before she decides to buy it. I haven't tried anything from their brand yet, but sounds like a pretty awesome concealer. Definitely going to have to check it out. Oh wow i love body shop skincare but never thought of their makeup. I'm going to have to check out the concealer although I tend to lean on more dewy concealers. Great review! For me this was also the very first makeup product I tried.They also have a new blush & bronzer that looks really gorgeous. ia always up to mark. This product looks really good. I love matte clay concealers and I do love the body shop. They have such a great collection and their products are supposed to be all organic or natural. This is great! I'll have to look out for it! I agree,they have amazing natural and organic products and most important they don't test on animals. Some of their products are even 100% vegan!